In the course of their investigation Terak becomes entranced by his little human. But when he discovers why Necromancers want her and the great reward that awaits him if he betrays her, he must choose between the welfare of his Clan and not only Larissa’s life, but the fate of this New Realm as well. I think it would be wrong not to mention that there were some editing errors in this book. The spelling mistakes, missed words and grammar problems were enough to pull me out of the story on occasion but considering that is a major hot button of mine and that I never once considered giving up reading the book that should tell you just how good the story was. Since the version I read was an ARC I'm hoping a lot of these issues may have been resolved in the final version but even if they haven't I'd still highly recommend reading this book. 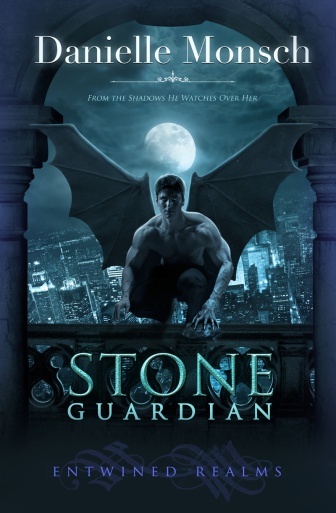 As much as Stone Guardian is labelled paranormal romance (and each book in the series will focus on a different couple) I would actually be tempted to label it urban fantasy. There is so much action and such fantastic world building that it really didn't feel like the romance was the main focus of the story. That isn't a complaint by the way, it had the perfect combination of romance and action to make it an edge of your seat read and have me hooked from the very beginning. This really is a fantastic start to a new series and it's one I'm incredibly excited about continuing!